5.93 points at 15 votes (rank 651). 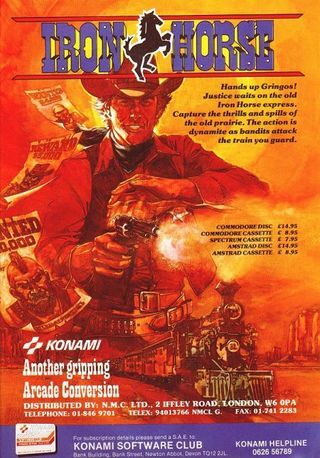 Scenario of the Wild Wild West (WWW). Our hero resolves to storm a train today and to casually give the approaching companions his piece of mind. He bravely fights his way forward from carriage to carriage, with drops of sweat oozing from the forehard. 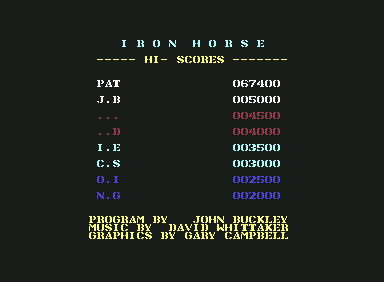 When he has finally, afters 6 carriages, reached the end of the level, things will become serious: cowboys in a bad mood, who probably will think of our hero as rather unappealing, seem to get spit out of a cloning machine and thwart the hero. After this stage (to our hero nothing is too difficult) he will be rewarded a considerable tip onto his account and he goes on into the next level. By the way, the "hero" can only carry one weapon. At the beginning of the game he chooses between a pistol (revolver? ), whip or the mere fists. It is ok for the date of issue, 1987. The game is pervaded by acceptable scrolling and a graphic which is rather good, altough not too diversified. As soon as you've learned a few tricks, the game is played rather casually, otherwise it is rather difficult. The controls are good, although a few commands need to be given through the keyboard (fire wall, ducking). When you duck, you escape the hostile shots and lassos. But don't wait for too long: the evil boys are really trained and very quickly on the spot. You can also avoid the knives which fly around in the third level by ducking. At the end of the third level stay ducked and shoot to the right. As weapon I recommend the pistol. The whip is too slow, the fists will give you double points, but then the game is three times as hard. To be able to send a fire wall you first need to collect a fire bottle. You can also climb ladders and search your way over the roofs of the waggons. 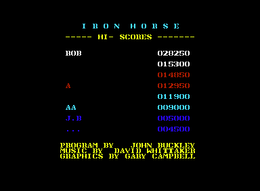 Z-Mat: "Clearly this is an exceptional game from the best C64 time: 1987. It could get a bit frustrating, a strong stamina (if present) on the other hand secures that you always proceed. 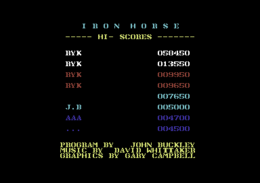 But Iron Horse is surely never boring..."
Sledgie: "Iron Horse on the C64 is a remake of the fruit machine arcade game Iron Horse from 1986. The realisation is for the relations of a C64 rather good. But I think it is too hard to play. That's why I give it only 6 out of 10 points." Guybrush: "There are definitely better games of this genre. Not bad but also not exhilarating. I give 4 points." FXXS: "I can only agree with Guybrush, especially because in the first level you seemingly just have to stand into a niche in order to shoot yourself with continuous fire to the highscore... There will always appear new enemies, no matter how many you've already killed... on the other hand proceeding is really so frustratingly difficult, that without a trainer it is almost not playable... also 4 points from me." This page was last modified on 12 August 2017, at 10:18.